The Pet bicycle carrier is a portable basket that accommodates pets in a safe and comfortable environment. The whole set-up requires no tool or additional components and the installation and removal is super easy. This product provides an enjoyable way to go for a leisure ride with your pet and it can support pet weight up to fourteen pounds. Comfortable chin rest and an inner padding that is removable. Comes packaged and ships very flat for simple storage. 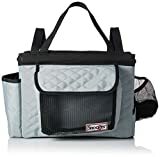 Has a clipping for the inner leash and comes with numerous pockets for storage. Features a pocket on the inside and its covered form rain. The Pet bicycle carrier that enables you to go on rides with your pet safely nested behind you. The under of the carrier is lined with metal braces that rests nicely on the fork of the bike thereby preventing the carrier from rubbing against the tire. Buckle straps ensures the carrier attaches nicely to the handlebars. The following tips should be followed to ensure a safe and proper use of your carrier. Ensure you get the right measurement for the carrier and compare it your bike’s measurement as this product will not attach well to smaller bicycles because the carrier is somewhat big. Ensure your pet is comfortable with riding in a carrier before actually taking it for a ride along attached to your bicycle. When using the carrier, do not attach a leash on the collar of the pet as they could try to hop off and in the process hurt their neck. Do not use a carrier if you will be riding over rough and bumpy terrains and this could cause the carrier to work loose from its mounting or make the pet uncomfortable. Make sure you don’t fit bigger pets into the basket. The maximum weight allowable is fourteen pounds. The installation of the carrier is super easy and takes just seconds to attach to the bike. 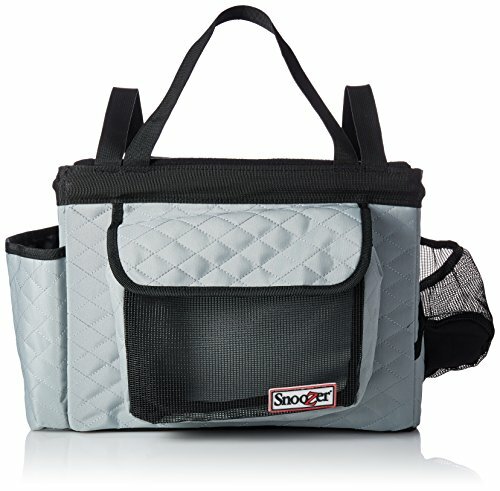 It has pockets on the side where you can stow the leash and even water bottles. The rain cover that comes with it is very handy for those times when the weather can be unfriendly. The carrier comes recommended for fun seekers who like biking with their pets and though it’s a bit pricey, it offers safe carriage and protection for your pets.